Homesteading in a Condo: Is the Iowa flooding man-made? Is the Iowa flooding man-made? 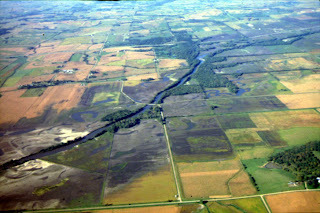 From the linked piece, above: "Plowed fields have replaced tallgrass prairies. Fields have been meticulously drained with underground pipes. Streams and creeks have been straightened. Most of the wetlands are gone. Flood plains have been filled and developed. "We've done numerous things to the landscape that took away these water-absorbing functions," [Professor Kamyar Enshayan] said. "Agriculture must respect the limits of nature." Agriculture of the last 60 years is nothing if not disrespectful. It's not unlike the miles and miles of wetland which used to exist around New Orleans and below it, at the delta of the Mississippi. Wetlands function not only as a natural water filter, but also as a buffer against flooding and wave formation along coastal cities. Most of our coastal wetlands have slowly been drained over time for development, and in the case of New Orleans, to devastating results. There is a complicated solution, but a solution nonetheless: If the floodplain along the Mississippi was allowed to regenerate tall prairie grass and wetlands, and if no one lived in it or farmed it, flooding (as it effects people and economies) would be a very rare occurrence indeed. Of course, there is the daunting task of relocating towns and farms. It may take a generation or three, but would be one more big step towards living in harmony with nature, not fighting it. I lost touch with the controversy that was going on down by Gibraltar where the developer wanted to drain the wetlands, even though it is clearly outlawed. He was trying to get some kind of variance. Do you remember/know what happened? I drove down there a week or so ago and it didn't look like anything had happened (thankfully!). This flooding is scary. I wonder what will happen to food prices? Tell me about it, Holly! we have all the same problems here - creeks are now concrete drains, rivers are all changed and "developed" and then, when they flood, there are all the compensation claims from people who bought into such flood-prone areas believing that it could never happen. What a world! What a nightmare!